Next time you glance up at some birds on a telephone wire, be aware that they may actually be the participants in someone else’s online slot machine; specifically that game could be Birdz, an interesting and innovative releases from Games Warehouse with a constant supply of bonus features and cute characters. 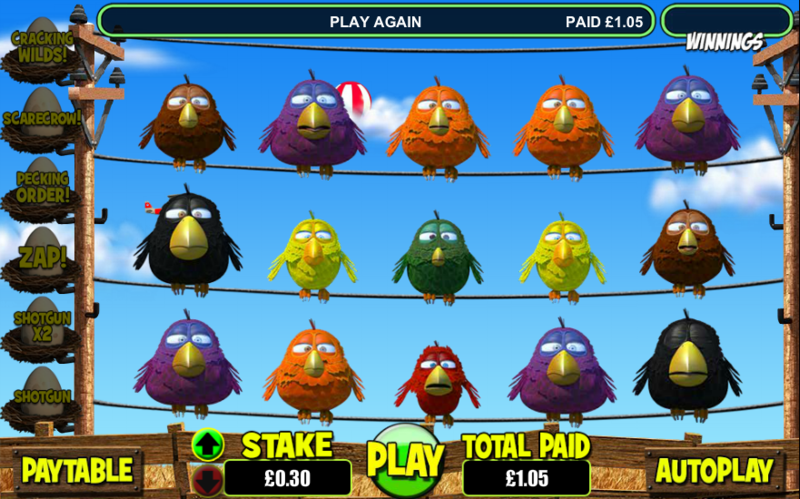 Birdz is a five reel slot with three rows and thirty fixed paylines; as we’ve already intimated, the gameplay takes place on three telephone wires strung between two telegraph poles. There’s a bonus trail on the left hand side and when you press ‘Play’ the birds will fly in from the distance and settle in their positions. Unsurprisingly the symbols are birds of various colours – orange, green, black, blue, yellow, purple, brown and red. The wild symbol is an egg which will substitute for all others to help form winning combinations. On each win those symbols involved will disappear and be replaced by more flying in from above; more wins can be formed and this process continues until there are no more wins. Shotgun – a shotgun blasts one of the birds into a pile of feathers and a new one replaces it. Shotgun x2 – a shotgun blasts two of the birds into piles of feathers and two new ones replace it. Zap – one of the three wires is electrified and all the birds there will be zapped and replaced by more falling in from above. 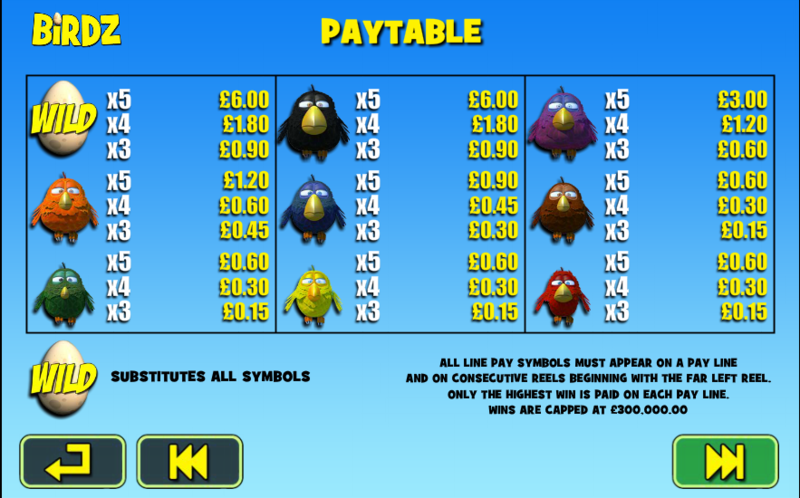 Pecking Order – at least three of the lower value symbols are replaced by higher value ones. This is a randomly occurring feature in which birds will fly in and out until a win is formed. Birdz is a really enjoyable slot to play and it’s certainly all-action with bonus features on more or less every spin; if you think you’ve seen something similar before then you’ve probably played Thunderkick’s Birds On A Wire or Betsoft’s Birds! Anyway it’s well worth checking out so give it a go.